Despite their importance, no consensus exists regarding how ILDs form, evolve, and whether they represent a complete sedimentary record. It is currently uncertain whether the modern shape and form of these mounded landforms is representative of their total depositional volume or whether the mounds are degraded examples of once larger deposits. Resolving this controversy has broad implications for not only the sedimentary history of Mars, in terms of how much sediment was deposited globally, but also the planet’s aqueous history and sulfur budget. An unlikely solution to part of this problem can be found by looking at landslide deposits. Landslides on Mars typically have runout distances much larger than equivalent features on Earth, which means that there is a greater chance of them interacting with other features. Typical landslides in the Valles Marineris canyon system on Mars have topographic profiles consisting of a steep headwall in the source region, with the landslide flowing, sometimes large distances, downslope before gradually toeing out onto the surrounding terrain. 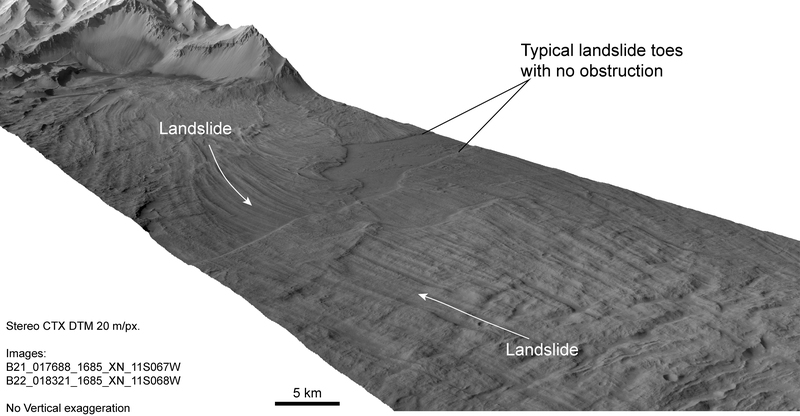 However, at least three large sets of landslides in Ophir Chasma appear to have noticeably different morphologies to other landslides on Mars. These features differ by having an increase in height towards their front edges, showing distinctive concave scarp faces that are up to 500 m above the base level, and up to 400 m higher than the preceding part of the landslide deposit. These scarps are 1 – 2 km from, and importantly, mimic the shape of the current extent of the ILD outer boundaries. Image 2. Example of an obstructed landslide in Ophir Chasma, Mars. CTX DTM made at the UK NASA RPIF (Regional Planetary Image Facility) at University College London. Images B01_009895_1764_XN_03S071W and P22_009750_1765_XN_03S071W. Image credit: NASA/JPL/Malin Space Science Systems. The most likely explanation for the formation of these frontal scarps is that the leading edge of a landslide has piled up in front of an obstacle that has since been removed. The plausibility of such landslide obstruction is demonstrated elsewhere in Coprates Chasma, where landslides have ridden up between 500 and 800 m in height against bedrock material in the centre of Coprates Chasma that has not been subsequently removed. 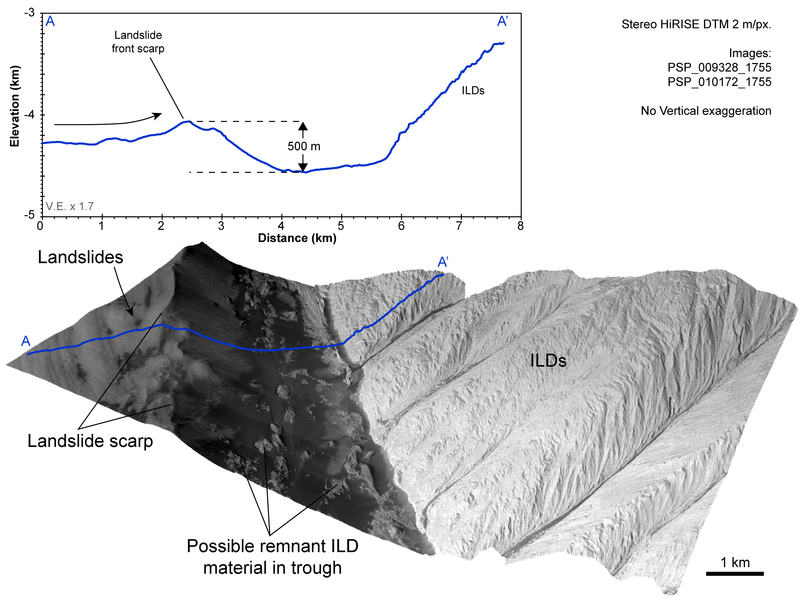 Given that the landslide scarps mimic the outline of the ILDs, it is most likely that the landslide obstacles were ILDs that were larger in the past and have since reduced in size, effectively pulling away from the landslide front edges. Since the landslide event, the ILD mounds have retreated from the landslides by up to 2 km, indicating high erosion rates at the mound front and significant volume loss. As the landslide deposits have likely undergone less erosion than the ILDs, crater counting studies of their surfaces can offer a timestamp on the landslide formation and thus quantify the retreat rate of the ILDs. Image 3. Close-up example of an obstructed landslide in Ophir Chasma, Mars. HiRISE DTM made at the UK NASA RPIF (Regional Planetary Image Facility) at University College London. Images PSP_009328_1755 and PSP_010172_1755. Image credit: NASA/JPL/University of Arizona. These crater dating studies show that these ILDs have been in a state of net degradation for at least the last 200-400 Ma of Mars’ history, when the landslides formed. The required erosion rates are higher than previous estimates for this era of Mars’ geological history, but are possible by aeolian abrasion if the mound contains friable materials, or if sublimation of ice within the mound enhances modification. Similar high erosion rates have been found in desert regions on Earth, such as the Qaidam basin, where friable deposits are essentially sandblasted by wind action. In either case, the apparently unique landslide interactions in Valles Marineris indicate that the current form of ILDs of similar morphology on Mars, such as Aeolis Mons in Gale Crater, might under-represent their total depositional volume and likely the global sedimentary record. Golombek, M.P., Grant, J.A., Crumpler, L.S., Greeley, R., Arvidson, R.E., Bell, J.F., Weitz, C.M., Sullivan, R., Christensen, P.R., Soderblom, L.A., and Squyres, S.W. (2006), Erosion rates at the Mars Exploration Rover landing sites and long-term climate change on Mars, J. Geophys. Res., 111, E12S10, doi:10.1029/2006JE002754. 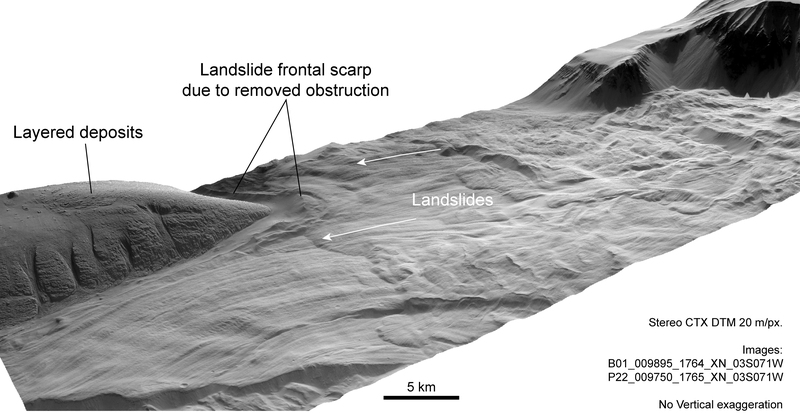 Grindrod, P.M., and N.H. Warner (2014), Erosion rate and previous extent of interior layered deposits on Mars revealed by obstructed landslides, Geology, 42, 795-798, doi:10.1130/G35790.1. Kite, E.S., Lewis, K.W., Lamb, M.P., Newman, C.E., and Richardson, M.I. (2013), Growth and form of the mound in Gale Crater, Mars: Slope wind enhanced erosion and transport, Geology, 41, 543–546, doi:10.1130/G33909.1. Michalski, J., and Niles, P.B. (2012), Atmospheric origin of Martian interior layered deposits: Links to climate change and the global sulfur cycle, Geology, 40, 419–422, doi:10.1130/G32971.1.